City lights of Dubai, United Arab Emirates, are featured in this image taken by the Expedition 30 crew aboard the International Space Station. The City of Dubai--the largest metropolitan area within the emirate of Dubai--is a favorite subject of astronaut photography largely due to the unique artificial archipelagos situated directly offshore in the Persian Gulf, which were built such that their full design is only visible from the vantage point of an airplane -- or an orbiting spacecraft. The city presents an eye-catching appearance at night that vividly displays the urban development pattern. In this detailed image, taken with a long focal length lens and digital camera optimized for fast response and high light sensitivity, several interesting patterns can be observed. The highways and major streets are sharply defined by yellow-orange lighting, while the commercial and residential areas are resolved into a speckle pattern of individual white, blue and yellow-orange lights. Several large and brilliantly lit areas are large hotel and mall complexes, including the Burj Khalifa Tower, the world's tallest building at 2,717 feet, or 828 meters. The brilliant lighting of the city contrasts sharply with both the dark Persian Gulf to the northwest, and largely undeveloped and unlit areas to the southeast. 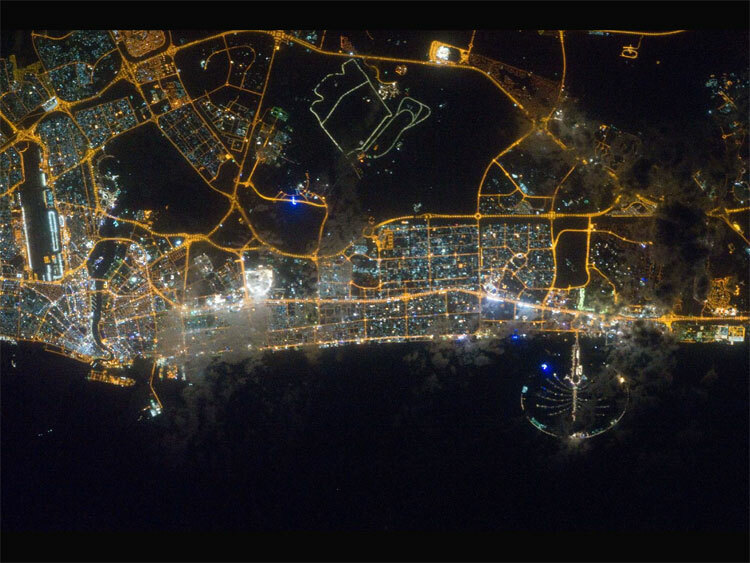 Likewise, the clusters of lighting in the Palm Jumeira complex at bottom right correspond to the relatively small part of the archipelago that has been developed. Isolated areas of blurred city lights are due to patchy clouds.